I started scrapbooking in 2002 and started subscribing to Memory Makers magazine shortly thereafter. I still remember Angelia Wigginton's layouts as being ones that really stood out to me. Back then, I used to tab pages that had layouts I especially liked with little post-it notes and pages featuring Angelia's layouts often got a tab so that I could easily visit them again for future inspiration. Of course, Angelia is a great photographer and designer; however, even more than that, I think it was her unique and inspiring combinations of patterned papers that really inspired me...probably because pairing up patterned papers was certainly something that I felt was a weakness for me. So, when I saw that Angelia was coming out with her very own book on that very topic - using patterned papers on layouts - I was thrilled! Playing with Paper: Innovative Ideas for Using Patterned Papers in Your Scrapbooks is perfect for any scrapbooker who needs a little guidance and confidence-boost in this aspect of scrapbooking! A Little Goes a Long Way: As the title suggests, it doesn't always take a multitude of patterns to create a successfull layout and sometimes just one or two can be just what the topic or theme at hand requires - whether that means using a full sheet or just bits and pieces of pattern. Mixing Three Patterned Papers: Wigginton prefaces the chapter with, "Three is one of those magical numbers that pops up in fairytales, stories, myths and even in design." and shows how this concept is no different when it comes to scrapbooking. She discusses successful formulas for combining various patterns such as the Quart/Pint/Ounce theory. Bits & Pieces: Don't you dare through away those scraps! 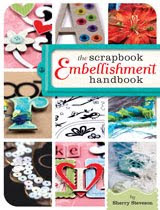 In this chapter, Wigginton demonstates how even the smallest bits and strips and lead to terrific design...and help to stretch your scrapbooking budget! Divine Details: Another way to stretch your scrapbooking budget is to create your own layout accents from your healthy stash of patterned papers. Examples are given in this chapter to demonstrate how everything from simple circles and squares to intricate swirls and flourishes can be fashioned from your stash. Lots of Layers: "The world around us is full of layers," says Wigginton. That's what makes things interesting. Adding layers to your scrapbook layouts can only add visual interest as well as depth and texture. Inspiration Station: This chapter gives proof that anything can be an inspiration for a layout - even the patterned paper itself! Anything Goes: When you're ready, this is the chapter to reference when you're ready to kick it up a notch. It highlights ways to use 4 or more patterned papers on layouts in a variety of ways. Each chapter of this book also features a special "3 Way" section. Some topics covered include three ways to scrap the same three photos, three ways to scrap the same sketch, three ways to use the same three patterned papers, and more. In addition to the amazing layouts of the author, this book also includes the creativity of the following scrapbook artists: Linda Albrecht, Amber Baley, Christine Durmbeller, Davinie Fiero, Irma Gabbard, Jennifer Gallacher, Greta Hammond, Cari Locken, Mary MacAskill, Jenn Olson, Kelly Purkey, Nicole Samuels, Lisa Storms, and Susan Weinroth. Visit the Playing with Paper page at Amazon.com. You can also read more of my reviews for other recommendations.